After taking a break through the summer Halcyon once again cranks it up to provide you with what will be the definitive psy trance event of 2010. Spread across 3 rooms of music, in a truly underground warehouse location, Halcyon returns with its biggest and most exciting event yet. After a break for summer the Halycon crew is back from putting on and playing at some of the world’s best festivals to bring you a party of truly epic proportions. With every DJ on the line-up a headliner in their own right, this is London’s definitive dance music event of 2010, spread over three rooms in a underground location covering psy trance, psy breaks, progressive, techno, minimal, electro, house, disco and all things eclectic and electronic in between. We’re so excited we hardly know where to start describing a line-up like this, but we’re going to give it our best shot… Hallucinogen Live from Twisted Records is top of the bill alongside Astrix and X-NoiZe who’ll get you up on the dancefloor to celebrate the 13th birthday of leading psy trance label HOMmega Records. Astrix is also launching his third album ‘Red Means Distortion’ and hasn’t played in London since Halcyon last summer, so we can’t wait to hear what he’s been concocting in the studio. He’s joined by fellow HOMmega production geniuses X-NoiZe, another Halcyon exclusive who haven’t made it to these shores for far too long and are guaranteed to keep their anthems rolling, as well as Pointzero Records’ Zeus, Matt Loraine vs Andy Leppard and Mutagen Records’ Andy Forse. While 13 years is one hell of an achievement for any label, Hallucinogen, aka Simon Posford personifies the incredible heritage psy trance has in the UK over the last couple of decades. Starting out as an engineer for the pioneering Dragonfly and T.I.P. labels, it’s no exaggeration that his albums ‘Twisted’ and ‘The Lone Deranger’ helped make psy trance what it is today—in fact Astrix cites ‘Deranger’ as the track that changed his life! Headlining the AlphaOmega Room, Hallucinogen is supported by the legend that is Prometheus aka Benji Vaughan, one of Twisted Records’ top artists who regularly plays all over the world under several aliases, but like label-mate and collaborator Hallucinogen, rarely touches down in London for a set of full-on Twisted psy trance. Joining the outlandish display of talent on offer is psy-breaks pioneer Mood Deluxe aka Cameron Leonard-Schroff: he’s launching his new album ‘Hot Points’ and after over a decade of perfecting his fusion of full-on psy trance, breaks, electro, techno and glitch you know it’s going to be worth coming for this alone. Did we mention he studied under Alessandro Cortini, the synth and keyboard player for Nine Inch Nails as well as Terry Riley of Michael Jackson fame? If you haven’t heard of him until now, it’s unlikely you’re going to forget him after this. Twin sons of Brazilian psy trance DJs Swarup & Ekanta, Alok & Bhaskar Petrillo stopped rebelling against their parents and started producing psy trance when they were just 12 years old, forming Logica shortly afterwards and were soon playing at festivals like Universo Parallelo. Fresh from headlining Waveform, they’ve already achieved more than most DJ/producers double their respective ages. After hearing far too many Avalon wannabees rinsing tracks from his recent Beatport No. 1 album ‘Distant Futures’ at parties all summer, we can’t wait to hear this Nano Records protégé’s master class in production on the Halcyon sound system. Another rare London appearance from a still rising star who’s spent most of the summer on the road, Leon Kane has been rocking out parties everywhere from Boom to Brazil to Burning Man, having played in over 20 countries in the 12 months. He’s joined by Neutrino from A.T.A.R.I. Project, who’ll also be showcasing his latest productions. Our third room is being brought to us by Camden’s InSpiral Lounge, created by a group of event and festival organizers with an environmental message, who’ve put together a kicking electronica soundtrack for you to chill to — or not as the case may be when you see who’s playing! A musician since childhood, Beckers played in rock and funk bands before he started producing his own music and is now considered one of the kings of prog. He’s joined by Mexico’s finest musical export, DJ Moon, and local Disco of Doom DJ Tom Real as well as InSpiral resident and events manager Aliji. They’re also building a café for you to relax and recharge in, with rejuvenating drinks and snacks to help you stay up all night. Halcyon residents Liquid Ross, Dejavoo and Libra 9 aka Phil Lankester are all psy trance heavyweights in their own rights, for they’ve been putting on parties, DJing, producing, and promoting for a lifetime between them. Another key face on the festival circuit who’s spent more time out of town this summer than he’s been in London, Ross helps manage Liquid Records in between holding the UK psy trance scene together with a swizzle stick. Dejavoo is the project of DJs Kristian and Kalimamboh who’ve been rocking dancefloors all over the planet with their ace productions as well squeezing out new material in the studio over the last year, while Phil Lankester cut his teeth in the Brixton underground for many years before hitting the big time with his driving and uplifting Libra 9 sounds. It should go without saying that like previous Halcyon events at Matter and The Fridge, Ewer Street Warehouse will be decked out with top of the range mind-bending décor, visuals, lighting and sound. Every Halcyon so far has sold out and this is indeed the biggest production and best line-up to date: we can only recommend that you get your tickets now for what’s going to be London’s party of the year. With just over 4 weeks to go, Halcyon production plans are in full swing, flights are booked, hotels confirmed and tickets are literally flying out the door!!!!! Each room is being individually designed from the ground up to deliver a state of the art clubbing experience in a genuine underground warehouse space. 3 arches of music, composed of 2 main rooms of cutting edge psy trance with the 3rd hosted by the legendary Inspiral. In addition to this we have a chill out café, market stalls and a super cool outdoor bar and smoking area. Halcyon Pre Party – This Sunday at Cyberdog! 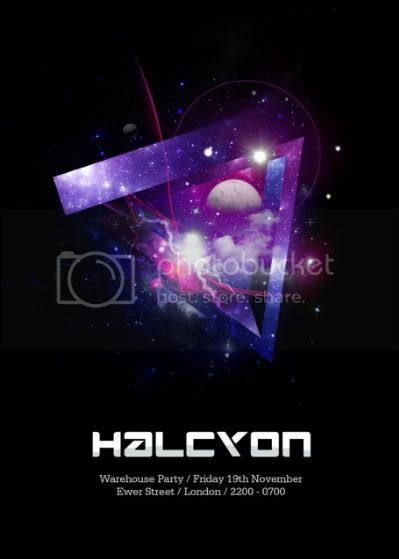 Halcyon and Cyberdog present the Halcyon Warehouse Party pre-party on Sunday 14 November from 2pm–4pm @Cyberdog Camden. In addition to DJ sets from Halcyon’s Liquid Ross and Dejavoo, there’ll be ticket giveaways and discount ticket sales — tickets for the Halcyon Warehouse Party on Friday 19 November will be available for just £15 — as well as copies of Astrix’s new CD ‘Red Means Distortion’ and Mood Delux’s ‘Hot Points’ for those who get there early. See you on the dancefloor! HALCYON @ MATTER - Hallucinogen Live, Shpongle DJ set & many more.